To get to peak performance on-court, the three-time NBA All-Star is looking to make strides off it to get there. 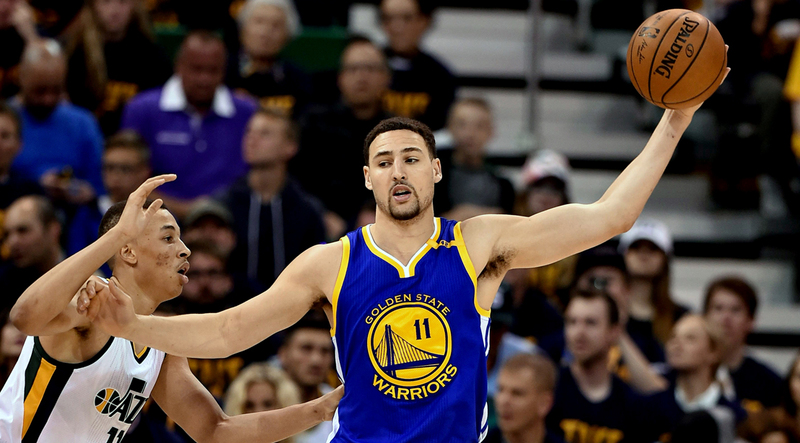 The NBA Playoffs are in full swing, which means barring injury or a shocking upset you can expect to see Klay Thompson schooling opponents on the court. The Golden State Warriors 6'7" shooting guard is a veritable scoring machine in the postseason. Last year, the 2016 NBA Three-Point Contest champ averaged more than 24 points per game in the playoffs as his Warriors came within a game of achieving back-to-back titles. Having entered the league as a shooter, Thompson has worked tirelessly in the gym—and the weight room—to transform himself into one of the league’s best all-around players. M&F: Basketball players are increasingly focused on improving their bodies. How much time do you spend in the weight room? KT: I try to get in there four times a week. During the season, it’s not really about gaining a lot of strength; it’s more about maintaining strength and injury prevention. Do you look forward to hitting the weights? I enjoy lifting. I’m not in there doing hang cleans for two hours, but I’m doing a lot with bands, dumbbells, kettlebells, and my bodyweight. I do a lot of dynamic workouts to maintain strength and gain strength over the season. I’m trying to stay in great shape throughout the year, not overhaul my body. On average, how long do you spend working out? Which teammate can throw around the most weight? Probably David West. That guy is really strong. He’s like grown-man strong, too. That guy’s been in the league for 14 years. He boxes, he lifts a lot of weight. And the same with Andre Iguodala. That guy is freakishly strong as well. He can do 30 or 40 pullups at a time. Sorry to ask, but how much can you bench? My max is probably 400 lbs. That was a joke. No chance. I can get 225 three times. If I went to the NFL combine, I’d be as strong as a kicker. Shooting Star: Thompson has improved his points per game average every year since entering the NBA in 2011. But you’re stronger than your teammate Kevin Durant. At the 2007 NBA combine, he famously tallied zero reps of the 185-lb bench press. Yeah. But he was only 18 when he did that. So I cut Kevin a break. He’s gained a lot more strength since then. In terms of your diet, it must be tough to stay away from steak houses and room service on the road. I try to cut out fast food as much as possible, obviously. When you get older, you can’t recover like you used to. I drink a lot of water. I also drink lots of chocolate milk, especially after workouts. It refuels me, and it tastes great. I eat a lot of chicken, fish, and fruits. I eat beef, but only like once a week. I try to limit carbs. They’re so good, but I try to cut them out. My diet is pretty diverse. It’s not superstrict—I just try to cut out the fatty stuff. Over the past eight seasons—even going back to your college days at Washington State—you’ve managed to raise your game. How? I take the little things—like dieting, recovery, and training—seriously. I love the game of basketball, and it’s rewarded me so much in life. And I do really love to play it. I feel weird when I go a few days without doing it. My love of the game has spurred me to work really hard. If you guys make it back to the Finals this year against the Cleveland Cavaliers, will you try to do anything differently? I don’t think so, man. We had a great formula last year. We just couldn’t finish it out—48 minutes away from back-to-back championships. You can’t overthink it. So I don’t think we should really do anything differently. We believe in ourselves. That’s what’s got us so much success these last couple of years. To be honest, I think we were right there. We just let go of the rope a little bit. Super Splash Bros: Thompson and teammate Steph Curry are known as the Splash Brothers.